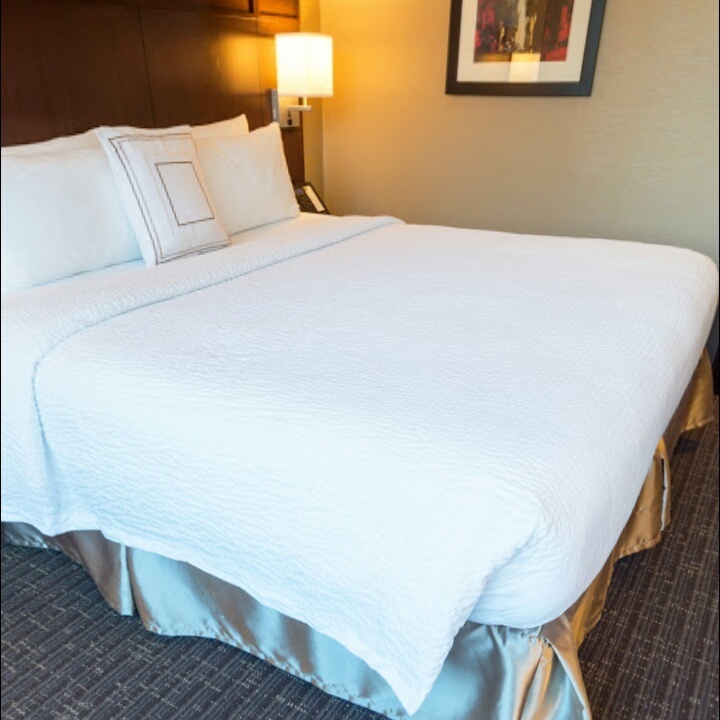 The hotel is close to Times Square, Madison Square Garden, Port Authority bus terminal and Penn Station. Its rooms are modern and stylish in beige tones and dark wood furniture. All include flat-screen TVs, coffeemakers, mini-fridges, and safes. The on-site Bistro Cafe, which has TV screens embedded in some of its paintings, serves breakfast (for a fee), lunch, dinner, snacks and cocktails and wine at the bar, but there is no room service. 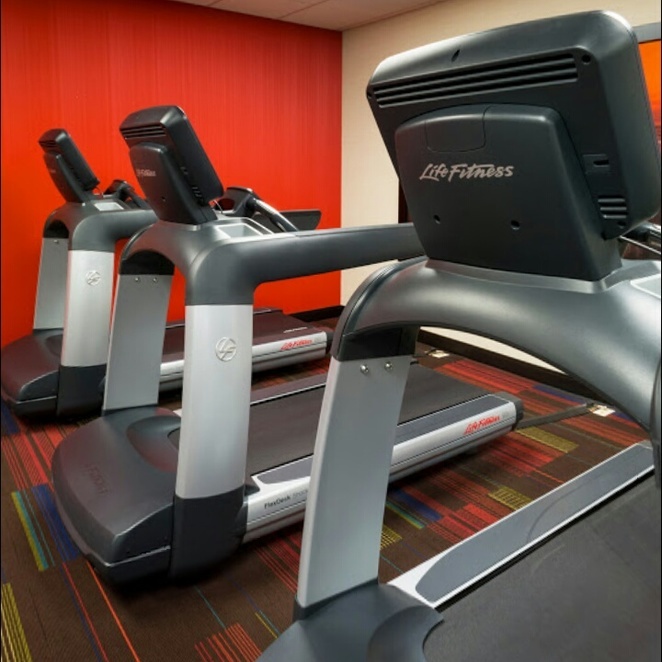 Other benefits include a small gym, computers and a printer for guest use, meeting rooms and free Wi-Fi. 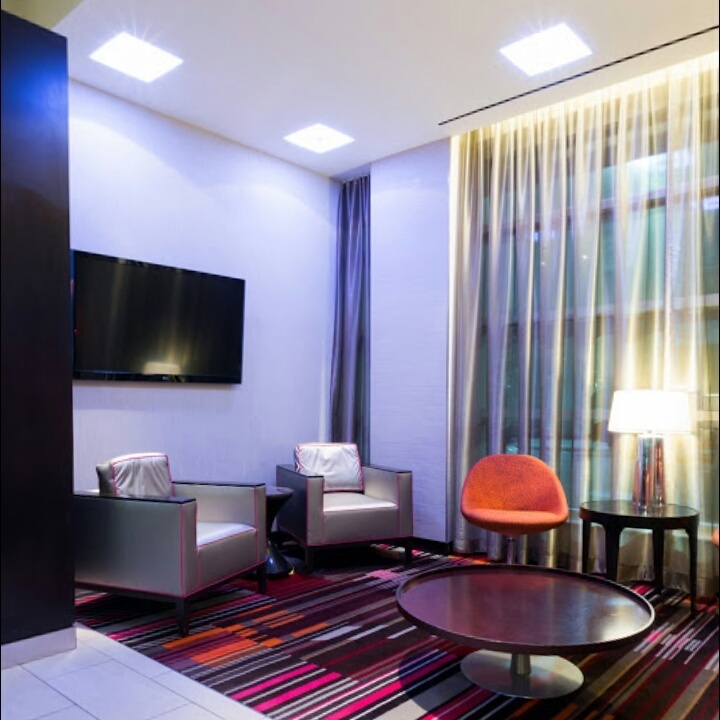 Travellers looking to escape chain brands could try the Times Square Night Hotel, which offers great design, a trendy restaurant, and room service. With its stylish interior decor, dim lighting, and touches of colour, Courtyard New York Manhattan / Times Square West offers a resting place in the middle of a vibrant neighbourhood. 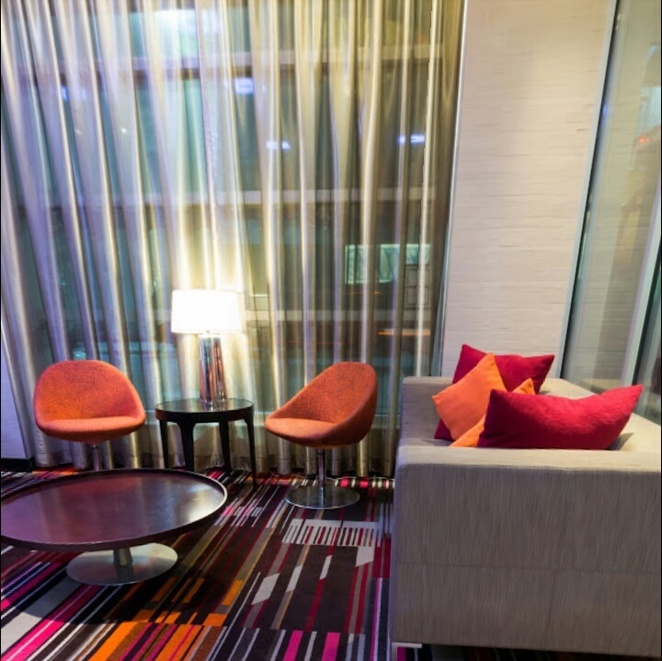 A lobby is punctuated by colourful rugs with rectangular patterns, floor-to-ceiling windows, funky lights, and contemporary, boxy armchairs and couches. While a lobby is not too spacious, there are other public places, such as a charming outdoor courtyard, where you can sit and enjoy a drink or a meal at the hotel's Bistro. The Bistro has its own distinctive decor - orange pops completely the geometric patterned rug, and several tables have their own built-in TV screens. Convenient location near Times Square, theatres, and several transport hubs and subway lines. This Courtyard is well placed for a blitz of sightseeing. It's about a 15-minute walk to Times Square, a nine-minute walk to Penn Station, a five-minute walk to the Port Authority bus station, and it's close to several subway lines - useful for more access attractions away, like the Memorial 9/11 (an 18-minute ride). The Empire State Building may be a bit of a hike to 17 minutes, but it's easy to take a crosstown bus to visit this iconic show. Madame Tussauds, the famous wax museum, is a seven-minute walk from the hotel, and the Broadway Theater District is a 15-minute walk or an 11-minute trip by public transport. This lively area has plenty of restaurants and shops on the surrounding streets. LaGuardia Airport is a 40-minute drive from the hotel, while JFK International Airport is a little more than the one-hour drive. The Courtyard New York Manhattan / Times Square Hotel rooms all have flat-screen TVs, mini-fridges, free Wi-Fi, coffeemakers, and irons and ironing boards. Higher-category rooms have city views. Rooms are air-conditioned. Bathrooms have more personality with bold, blue walls, silver mirrors trimmed, and dark wood vanities. They have either shower/tub combos or a glass shower. Paul toiletries and a Mitchell hairdryer are provided. As expected for a brand, the New York Manhattan / Times Square West Courtyard wraps up in some great amenities. The Bistro is well appointed and serves snacks, meals and drinks all day and evening, including Starbucks coffee. Breakfast is included in the rates and tenants have complained that it is expensive (you would probably go out best on your own at one of the nearby restaurants). The property is not large but has a range of cardio and weight-lifting machines, exercise balls, and free weights. 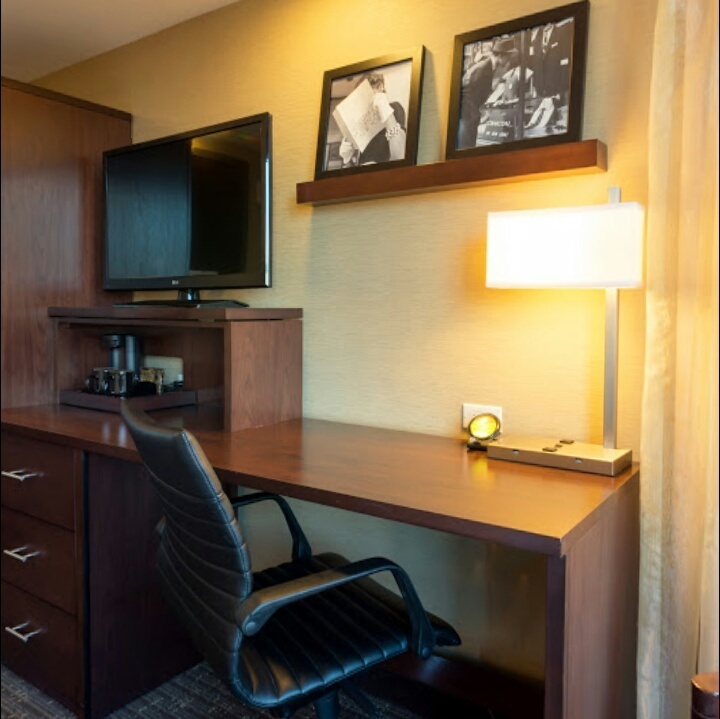 For business travellers, there are two fully equipped meeting rooms and two desktops and a printer in the lobby. Other features include coin laundry and Wi-Fi.